A private transfer by coach to Girona and the Hotel Peninsular. This is a small hotel situated on the edge (within 5 minutes walk) of the old city. We will be booked on a bed and breakfast basis giving ample opportunities to sample the local restaurants. A full day guided excursion of some of the most interesting medieval villages of the hinterland. Visit to Banyoles (with a possible excursion by boat around the largest and most beautiful lake in Cataluna.) On the way we call at the famous Torras chocolate factory to see the production sample and purchase. Return to Girona via Valle e'en Pas-Angles y Bescanó. Including the reservation and entrance into the gardens. Followed by a short stop in the resort of Blanes for a snack and browse. 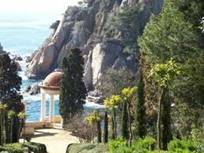 A visit to the wonderful Monastery of Montserrat with free time to explore this large precinct with its wonderful views over the unusual rock formations. Maybe take the funicular to the top. Prices quoted are for residents of the Baleares. It absolutely essential to have with you a copy of the Certificate of Empadronemiento from your respective Ajuntamiento to prove your entitlement to Residents Travel Discount. You now have to show this at airport check in. You must also carry your passport. You will be allowed one suitcase per person weighing up to 23 kg , on top of this you are allowed one piece of hand luggage of the normal required maximum size. The excursion by boat on the Banyoles lake is not included in the price. All prices are based on the availability of flight seats and hotel rooms and for that reason we require confirmation from participants ASAP. As we have to sign a firm reservation next week and at the latest 14th September to ensure such availability. A sum of at least 50% of the total (or maybe the full amount) should be paid, or transferred directly, to Banca March. Your payment should be made to Menorca Britannia account number 0061 0239 41 0022100118 and clearly state your name/s and VIAJE GIRONA. When shown as received on the bank statement this will act as your confirmation and a receipt will be forwarded. You should also telephone Sheila on 971366206 or email menorcabritannia@msn.com to confirm your reservation. The final payment should be made on or before October 26th. Should we not achieve the minimum numbers or should the trip have to be cancelled for other reasons outside our control, your money will be immediately refunded. Personal cancellation for whatever reason and travel insurance is not included and we suggest that you take out cover for the period as Menorca Britannia cannot make refunds should you have to cancel for personal reasons or for loss or damage to luggage. More information on the websites below.